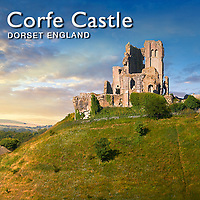 Pictures & Images of Corfe Castle, England. One of the great romantic views of England is Corfe Castle at sunrise. Set on top of a high pointed steep hill the shattered Keep and walls of Corfe Castle hint of its power before it great walls were dismantled after it fell to Parliamentarian forces in 1645. Corfe Castle was founded by William the Conqueror shortly after 1066. To help subdue England William built 36 castles and used to visit Corfe Castle to go hunting in the royal forest of Purbeck. Corfe Castle remained a Royal castle until 1572 when it was sold by Elizabeth I to her chancellor Sir Christopher Hatton. Corfe Castle was bought in 1635 by Sir John Bankes, Attorney General to Charles I and when the English Civil War broke out Corfe Castle was held in the name of the King. This was to be a fateful moment for Corfe Castle and by 1645 was one of the last Royalist strongholds in the south. It was besieged and fell and Parliament voted to Slight, demolish, the castle. Today Corfe Castle is a great medieval ruined castle and it is easy to image it in its heyday sitting in all its glory in the Dorset countryside.